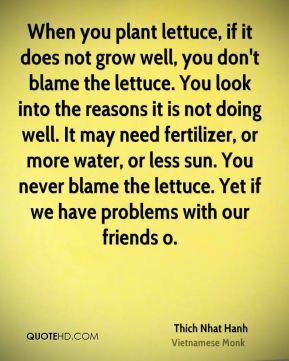 When you plant lettuce, if it does not grow well, you don't blame the lettuce. 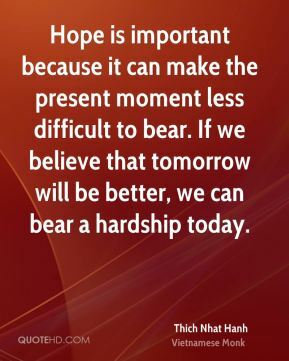 You look into the reasons it is not doing well. It may need fertilizer, or more water, or less sun. You never blame the lettuce. 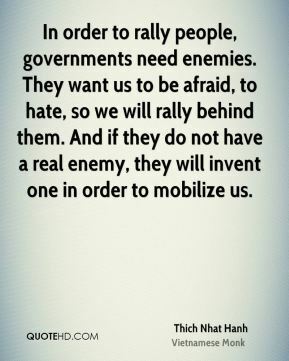 Yet if we have problems with our friends o. 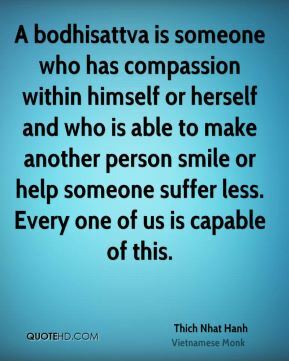 A bodhisattva is someone who has compassion within himself or herself and who is able to make another person smile or help someone suffer less. 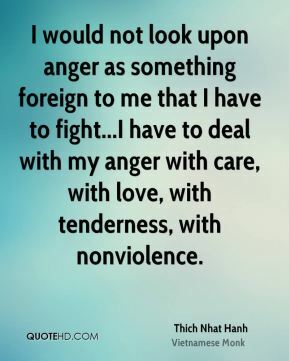 Every one of us is capable of this. 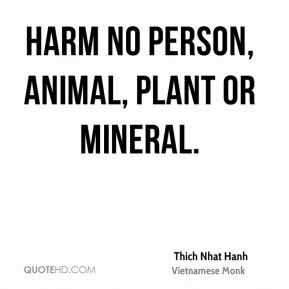 Harm no person, animal, plant or mineral. 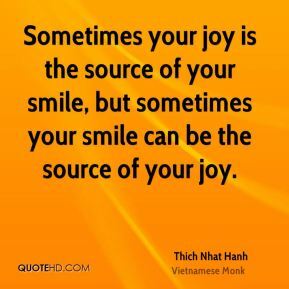 And once we have the condition of peace and joy in us, we can afford to be in any situation. 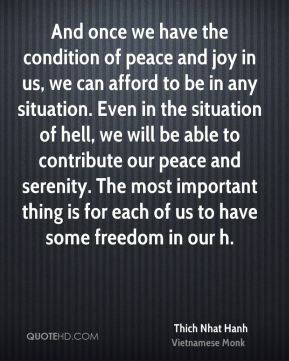 Even in the situation of hell, we will be able to contribute our peace and serenity. 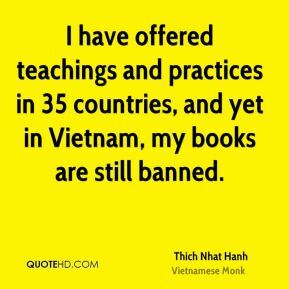 The most important thing is for each of us to have some freedom in our h.
I have offered teachings and practices in 35 countries, and yet in Vietnam, my books are still banned. 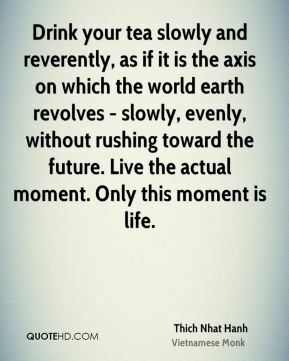 Drink your tea slowly and reverently, as if it is the axis on which the world earth revolves - slowly, evenly, without rushing toward the future. 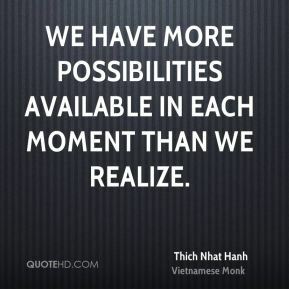 Live the actual moment. 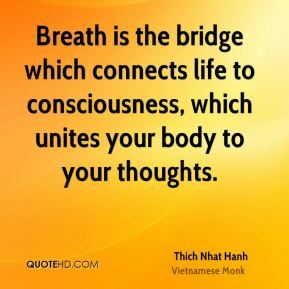 Only this moment is life. 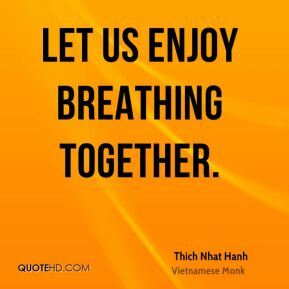 Let us enjoy breathing together. 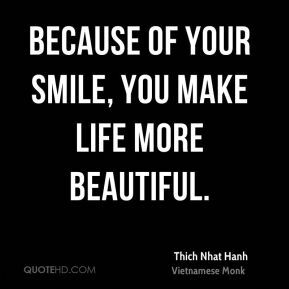 The most precious gift we can offer others is our presence. 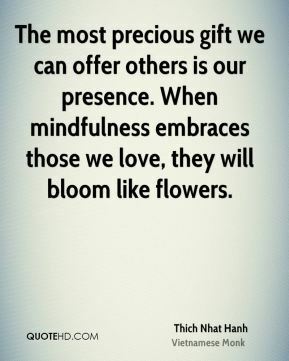 When mindfulness embraces those we love, they will bloom like flowers. 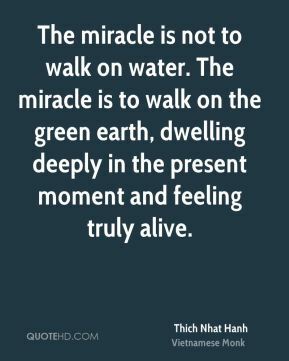 People usually consider walking on water or in thin air a miracle. 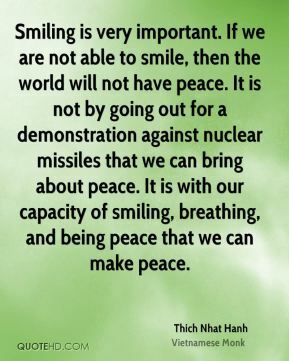 But I think the real miracle is not to walk either on water or in thin air, but to walk on earth. 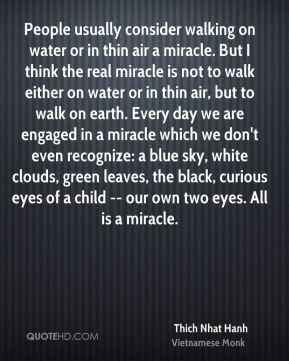 Every day we are engaged in a miracle which we don't even recognize: a blue sky, white clouds, green leaves, the black, curious eyes of a child -- our own two eyes. 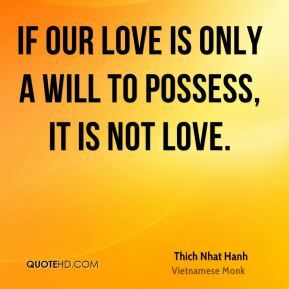 All is a miracle. 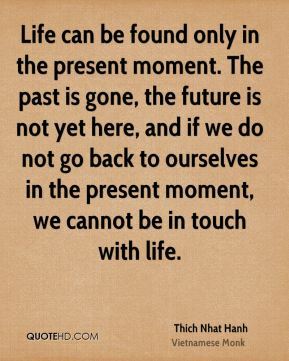 Life can be found only in the present moment. 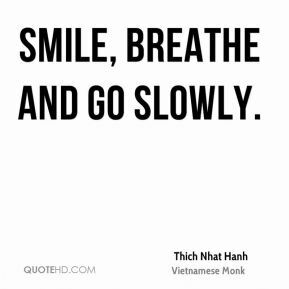 The past is gone, the future is not yet here, and if we do not go back to ourselves in the present moment, we cannot be in touch with life. 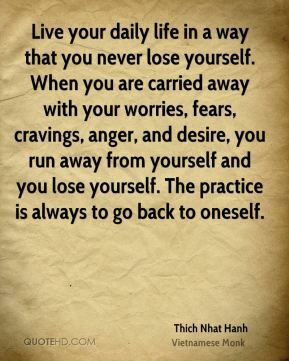 Live your daily life in a way that you never lose yourself. When you are carried away with your worries, fears, cravings, anger, and desire, you run away from yourself and you lose yourself. 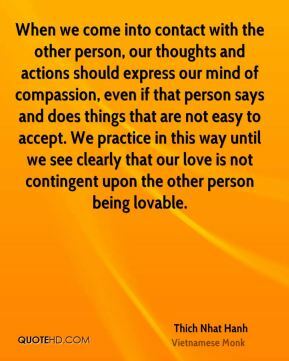 The practice is always to go back to oneself. 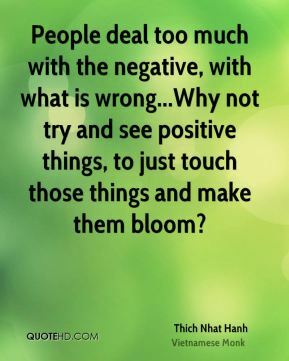 People deal too much with the negative, with what is wrong...Why not try and see positive things, to just touch those things and make them bloom? 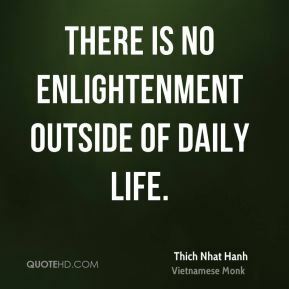 There is no enlightenment outside of daily life.